Shocking – a new game for the PSP that isn’t a racing game, doesn’t involve killing people with an assortment of weapons and if you didn’t know better you would have thought you were playing a Nintendo console. 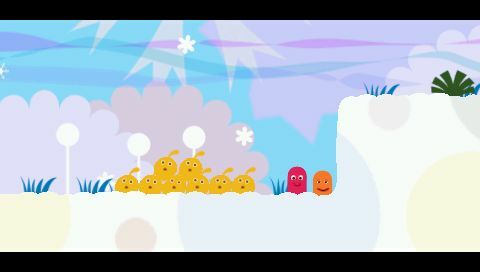 The game is LocoRoco. 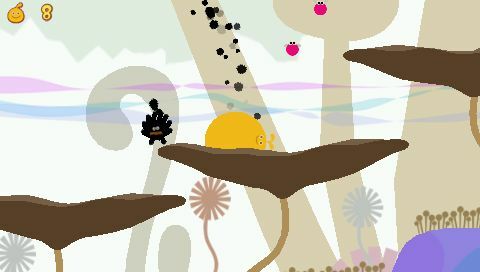 The aim of the game is to guide the LocoRoco to the end of the level. The controls are simple, the level designs are great – colourful and imaginative but it’s the animation that really stands out. Amazing. There are also lots of secret areas (think Mario) to explore so it’s not simply about getting to the level end in the quickest time. Music is just right – makes you smile which is pretty much the whole point of this game. I wish there were more like this on the PSP. Games that you can quickly pick up and play for 20 minutes without getting bored or spending most of that time creating characters, going through training modes etc. If you’ve got a PSP try out the demo – well worth it. Full Flickr set here.